Vesna's Party Blog: Cupcake Craze! Cupcakes are all the rage right now. Instead of serving cake at a particular function or event, people are opting for that sweet little individually wrapped mini-cake to serve their guests. The hot seller right now is the red velvet cupcake with sour cream icing...yum! Simply put, they are fun! It reminds us of being a kid again - we clearly remember the feeling of excitement when unwrapping a cupcake, and long to relive the experience. Magnolia Bakery in New York is said to have been the major trendsetter for the creation of cupcake shops everywhere. They create a moist cake, with a good cake to icing ratio, and a unique flavour combination. 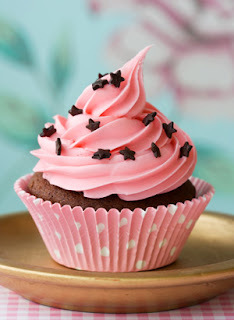 When buying your own cupcakes, make sure to taste test, as some shops make dry cakes with too much icing. Today, the cupcake industry is just as popular as the coffee industry. It's so popular that people have started to mobilize their business. Mobile cupcake shops have started to explode across North America. No need to try and find where the nearest cupcake shop is - it will find you! 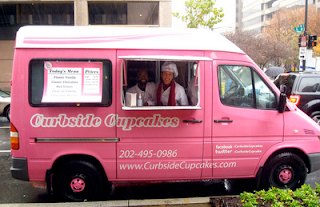 Some popular mobile shops are CupcakeStop, Curbside Cupcakes, Kara's Cupcakes, and Cupcake Diner. Cupcakes may be a trend for the moment, and one day it may fade, but for now it's here and we like it!